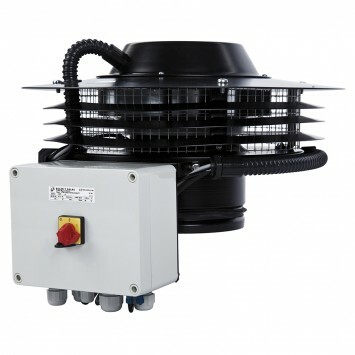 Hybrid type, self-regulating centrifugal roof fans, low profile, horizontal outlet to fit directly to a circular duct. Designed to ventilate homes and small work spaces, complying with the Technical Building Code. CTBH ECOWATT range fans start up automatically when temperature conditions do not permit sufficient natural air circulation. Structure and bird-proof guard made from galvanized sheet steel, protected by black polyester paint with aluminium cover. It includes duct connection flange seal. Brushless EC, direct current, high-efficient and low-consumption motor with external rotor. Supply 230Vﾱ15%/50-60Hz, IP44, thermal protection, and IP55 on-off switch, which can be moved away from the fan.